something strange has happened to me. i have been posting to this blog for 2 months now and i realized that i have never even mentioned the bins. i tend shop there pretty often and i get a lot of great gems. i've been a little obsessed with it every since i first visited portland in 2002.
perhaps i need to explain, if you are not from portland, then "the bins" not immediately strike a chord with you. "the bins" is a term lovingly given to the goodwill outlet centers. goodwill stores essentially are always trying to turn over their stock so that there is always room for new items, so after about 6 weeks, they remove the items from the store and send them to the outlet for their last chance to be sold before they are recycled, turned to industrial rags, sent overseas, or sold to salvage brokers. the glory of the outlet is that the clothes and housewares items are sold by the pound. one pound is $1.59. glass is .39 per pound. this price is for less than 10 pounds, however there is a bulk discount, so the more you buy, the cheaper it is per pound. the items are not neatly sorted and laid out for you, so there is a little bit of work that needs to be done to cash in on such a great deal. the items are dumped into huge movable plastic bins and laid out in aisles. each aisle is changed out ever few hours to constantly cycle the stock. usually a bin is filled with like items because that is how it came from the store, but not necessarily. there are textile bins, shoes, books, and "hard good bins" (aka everything else). there is also a section for bikes and furniture that are individually price (but priced cheaply and they are marked down in price each day they do not sell) the textile bins are not really any collection of a certain size or style, so little girls dresses are mixed right in with men's jackets. this just basically means you are in for a hunt. i don't think my love of the bins comes out of my frugality so much as it comes from my love of a treasure hunt. there is something intoxicating about not knowing what you will find there (and the added bonus that it will cost next to nothing when you find it!). it does take some effort and you really need to be in a certain mood to be able to put in the energy, but i find the pay off to be worth it. there are actually a lot of people in portland that make their living by going to the bins and scoring amazing things for little money (the 50+ pound discount is much to their advantage) and then reselling the items. these people can be a little intense and get a bit wild when new stuff comes out. portland is not the only place with a goodwill outlet. check this list for some places near you. + you might consider gloves if you are germphobic. remember that this is a collection of other people's donations and there could be some "undesirables". just proceed with caution. also, sometimes glass and things can break when they get thrown around on trucks and loaded into the bins or sharp edges can poke out, so be mindful before you throw your hands into the housewares sections. +i tend to take the "take now, think later" approach for efficiency. if i find someone that looks mildly ok, i will throw it in the cart. then, after i'm done shopping, i stop and take a moment to carefully go through everything and check for stains or holds, make sure it would actually fit, and of course ask the important question "do i REALLY need this?" +that being said...i won't lie, i am a totally scavenger. i do my best around the edges of the store or close to the registers because of other people doing the "take now think later" approach. someone else may have found some really cute things but realized they were not their size or they just didn't have a place for them, so they tend to leave a discard pile of some pretty awesome things. +leave the kids at home. i see a lot of...umm...let's go with "disappointing" parenting going on at the bins. if your child can reach up and stick their hands into the bins, they might not really realize what they are grabbing at and could end up getting hurt. it's a pretty consuming shopping experience, so it seems it is just really hard to shop and also keep your attention to the children. i don't even want to tell you how many times i have seen a child grab something from a bin that has been who knows where and stick it in their mouth. gross. it is definitely a great place to get toys and clothes for your kids on a tight budget, but it is probably best not to take them on the trip. +oxyclean is a gift from the heavens. seriously. get some at target and it will change your perspective on what is a salvageable item and what might be trash. i just got a cute pink vintage dress there on friday, but it had a little dinge to it (which just happens to a lot of vintage clothes) and i soaked it in the sink with oxyclean for an hour then threw it in the wash...now it is just as lovely and bright as they day it was purchased 40 years ago! BEST BELT BUCKLE EVER for $1.50! much love to katy for bringing it to my attention! she rules. it needs to be attached to a new, longer belt but wow! so amazing and perfect! 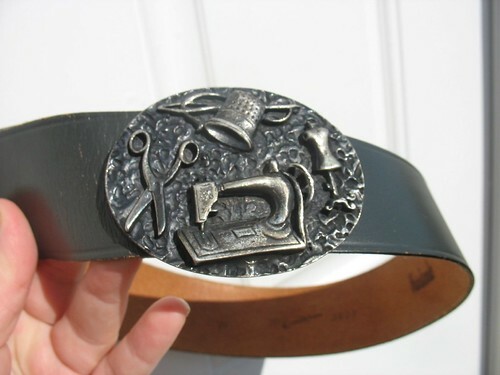 i also got a lovely dress, some fabric, a cake plate, some books on canning, and a few other gems...but this crafty belt buckle is one of my favorite finds to date. Love the "bins"!!! Jennifer is moving up to NC from Greenville and I believe I will miss the bins there! Clothes are $1.09 lb., Books/CDs/DVD/VHS/Vinyls/Glassware are only .25 lb. !!! We just picked up a cute couch for our daughter's room, in excellent condition, for $10! (including tax!) There is a bin store in Charlotte, but prices are a little higher and not as many treasures... Oh! Wanted to share my most favorite treasure found in "the bins"...an 8 gig iPod...yes, a genuine iPod! Pink to top it off! Paid less than $1 for it, bought cords at discount store and it works beautifully! Our kids love to dig for cool things as well. Oh, and don't forget to be sure to dig for the very bottom! You may be surprised what you can find down there! My first trip to the bins was quite the thrifting experience. Tons of fun rummaging through all that stuff. That belt buckle is a great find!